Pay What You Want stories at Techdirt. stories filed under: "pay what you want"
Learn how to build your brand and market your business with The Marketing Copywriter Bundle. Pay what you want and get 2 courses covering Facebook and Twitter marketing. If you beat the average price ($11.16 at the time of writing), you get the whole bundle with 3 additional courses covering effective copywriting principles, marketing analytics, and improving your business writing. You may recall Vodo, the website that was set up a few years back to help promote indie films by letting indie filmmakers promote their content for free with a "pay what you want" model on top of it. For a while, they'd either do things like release content episodically once enough money had been raised, or go with a more straightforward "give it away and pray" type of model. Over the last few months, however, Vodo's founder Jamie King has been revamping the service, taking obvious inspiration from the folks over at Humble Bundle -- and the result was recently launched: the Vodo: Big Brother Bundle. If you're familiar with the Humble Bundle, you'll get it right away. A bunch of different content is offered together as a bundle in a pay-what-you-want setup, with some content only available if you pay above certain levels to "unlock." One neat little innovation is that the Vodo bundles are curated by someone well-known -- in this case, former Wikileaks spokesperson Daniel Domscheit-Berg. Also, unlike Humble Bundle, this bundle crosses over different types of content. In the Big Brother Bundle, there's a video game, a film, a book and music, all somehow built around the concept of "big brother" and surveillance. And for the first 10,000 buyers who beat the average price, they also get a free month of the iPredator VPN. There's some good stuff in there, so check it out. I spoke with King a bit to see how the Bundle is going, and it sounds like it's off to a great start. He notes that, with the previous more general pay-what-you-want model for a single offering, the conversion rate was understandably low: around one out of every 2,500 to 3,000 visitors to the site paid. However, with the bundle, the conversion rate is massively better: one out of every seven visitors are paying something. As with Humble Bundle, if you pay more than the "average" price, you get extra content, and that continues to drive the price people choose to pay steadily upward as well. Vodo has added one more feature, with a "premium" price that's a bit higher, to get even more content, and King tells me about 10% of all buyers are paying above the premium level. One interesting tidbit: you can pay in Bitcoin, if you have some lying around. King also notes that it might not just be the setup and the model itself that gets people to buy, but the content. He told me that with this model, not only do users of the site appear to like it, but content creators are much more interested in working with Vodo as well under this model, meaning that they can source higher quality content, which in turn, makes for a better experience for users as well. In the first few days since the Bundle launched, it's already brought in over $15,000. Back when we first launched the Insider Shop, we made two PDF ebooks available at any price you choose: Mike's Approaching Infinity (on new business models and the economics of abundance) and our Sky Is Rising report on the state of the entertainment industries. More recently, we launched three fiction titles by our own Tim Geigner—Digilife, Echelon and Midwasteland—also available on a pay-what-you-want basis. They were an instant hit, and we're in the process of preparing new ePub versions. The thing we noticed right away was that a lot of people were choosing to pay, even though you can download all the books for free. Almost half of all book downloads were paid, with most people choosing the default $5 per book—even when buying four or five books at once—and several going above and beyond, with a few even paying $20 for a single title. 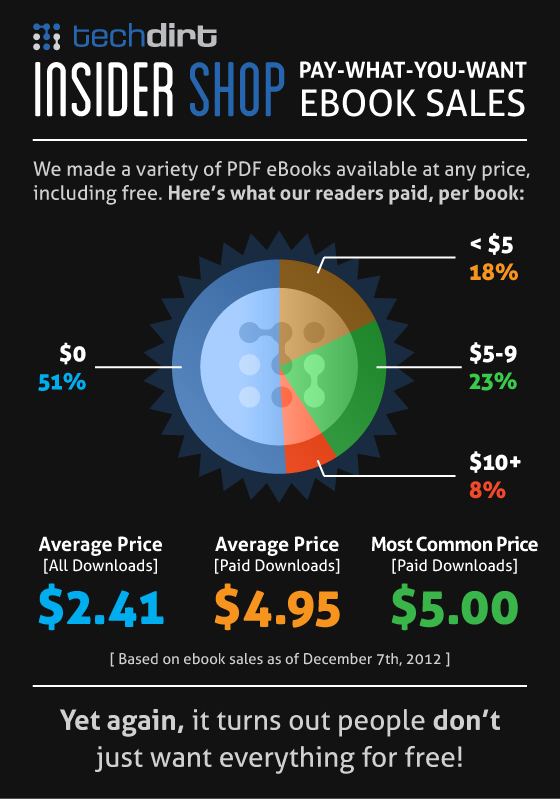 Thanks to everyone who has downloaded our ebooks, whether you paid $0 or $20 or anything in between! If you haven't gotten your copies yet, head on over to the Insider Shop and check them out. That's apparently the first time the Gaiman/McKean book is available in ebook form... There's also the charitable component. In most bundles, you can designate some of the money to go to EFF or Child's Play Charity -- and that's still true, but this time they've also added the Science Fiction and Fantasy Writers of America. It will be interesting to see how this goes. The music bundle did well, by any reasonable standard, but definitely didn't pop the way the video game ones did. It will be worth watching to see how this one goes as well, and if there are other ways that the Humble Bundle crew will continue to innovate. Last week, we relaunched our Techdirt Insider Shop with a number of new and different offerings, including (for the first time) the ability to do a "pay what you want" option to get some downloads, starting off with downloads of my book, Approaching Infinity, as well as the research report we came out with earlier this year, The Sky is Rising. We often hear from critics that if people can get something for free, they will, but here's a clear cut case of where that's not true (though we've seen it in many other cases as well.) It's only the early going with our store, but already, we've seen that two thirds of people who got the books decided to pay for it, with the average price being just under $5. Over 20% of orders were for $10 or more. We'll be curious to see what happens over time and if it changes. But, once again, it seems to suggest that, even if you're giving content away for free, if people want to support you, they will. We've written a few times about the rather awesome The Humble Indie Bundle folks who have built a business out of bundling up a few (independently produced) video games, and offering them in a simple to buy pay-what-you-want format, with certain incentives to get people to pay more. Each bundle has been more successful than the last. Today, the Humble Bundle folks are trying something new: music. Launching today, they're doing a similar offering, but rather than video games, it's music by They Might Be Giants, Jonathan Coulton, MC Frontalot, Hitoshi Sakimoto and Christopher Tin. And, if you pay more than the average price, you also get music from Ok Go. And, as always, there are options on how to allocate the funds you spend, including options to designate a portion to go to various charities. I'll be interested to see how well this does, but they sure chose an amazing group of musicians who are really well known to the geek/gaming crowd. We've written about or mentioned Jonathan Coulton, OK Go, MC Frontalot and TMBG before. Christopher Tin and Hitoshi Sakimoto are well known for their work in video games as well. It certainly seems like a really well-suited bundle. The bigger point, though, is seeing how the Humble Bundle is expanding its model to see how it works in other fields. If I were running an "affinity label" of some sort, where you have a bunch of different groups that attract a similar audience, I'd be watching pretty closely to see how this works out, because there's no reason you couldn't do something similar with a select group of artists. While we've seen pay-what-you-want models work quite well for digital goods, it's still uncertain as to whether the model works for tangible goods where the marginal cost of each sold item does not approach zero. However, that doesn't mean people shouldn't try. A Brazilian company launched a line of vending machines that sell books without a set price, allowing customers to decide what they want to pay for the book. That said, it's not entirely pay what you want, since the machines require that customers put a minimum of a 2 BRL note (equivalent to about $1.17 USD) to get a book. Initial reports claim that "sales at the promotional machines had already more than doubled within just over a month after the program’s launch, and most purchases are indeed paid with a BRL 2 note." While this sounds promising, there's no mention of how much more the books were priced before the new model was implemented, nor the profit margin beforehand. Furthermore, in looking at the vending machine, it's not apparent that customers are given any real reason why they should pay more than the minimum for the book. The books are just placed in a normal looking vending machine -- customers can't leaf through the book or even look at the back cover until after they've bought the book (and decided what to pay for it). This seems like a lost opportunity. Especially in a pay-what-you-want situation, it's still about giving customers a reason to pay more.